The Samsung Galaxy tablet’s onscreen keyboard reveals itself on the bottom half of the screen. If you find that keyboard comforting, you’re getting ahead of yourself. That’s because the keyboard may change its appearance and function as you use it. This feature can be useful but also disconcerting. The onscreen keyboard is shown in alphabetic mode. You see keys from A through Z in lowercase. You also see a Shift key for producing capital letters, and a Delete key, which backspaces and erases. Enter/Return: Just like the Enter or Return key on a computer keyboard, this key ends a paragraph of text. It’s used mostly when filling in long stretches of text or when multiline input is needed. Search: You see the Search key when you’re searching for something. Touching the key starts the search. Next: This key appears when you’re typing information in multiple fields. Touching this key switches from one field to the next, such as when typing a username and a password. Done: This key appears whenever you’ve finished typing text in the final field of a screen that has several fields. Sometimes it dismisses the onscreen keyboard; sometimes not. The large key at the bottom center of the onscreen keyboard is the Space key. 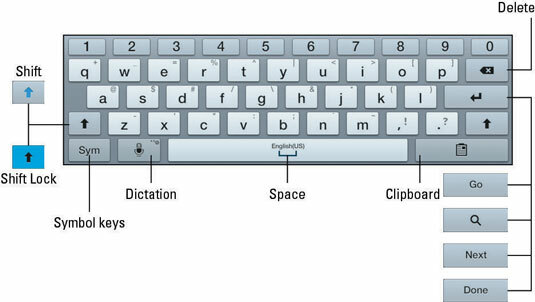 The keys to the left and right may change depending on the context of what you’re typing. For example, a www or .com key may appear to assist in typing a web page or an e-mail address. Other keys may change as well, although the basic alphabetic keys remain the same. To resummon the keyboard, touch any text field or spot on the screen where typing is permitted. To dismiss the onscreen keyboard, touch the Back button. The keyboard reorients itself when you rotate the tablet. The onscreen keyboard’s horizontal orientation is the easiest to use.